"The legendary Rydr pant is now available with a narrower silhouette. 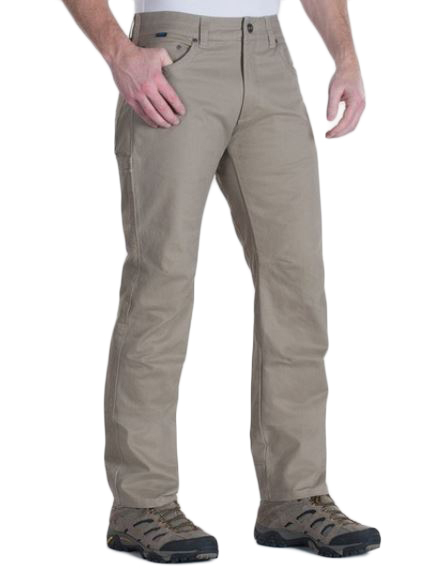 The K�HL FREE RYDR PANT is cut from our exclusive combed Cotton Euro Twill for tenacious, yet luxurious, style. The fabric has been slightly brushed for a softer feel, but tough durability remains. The TAPERED FIT tapers from the knee down for a more modern fit. K�hl's Born Free gusseted crotch and articulated knees allow freedom of movement, while the anatomically engineered fit follows your body's natural contours for superior comfort. Reinforced pockets and bottom cuffs reduce wear. �Double needle bar tacks at critical junctions for added reinforcement. TAPERED FIT Tapers from the knee down for a more modern fit, while the Vintage Patina Dye and river wash create a vintage look. �Articulated knees for freedom of movement. �Stealth Cell Phone Pocket "